Return of the King is one of a series of works called: Foursquare. To date the major brach of my whole output as an artist is a series of paintings and prints that utilizes a small square as a character in a simple visual language. The series, which I call Foursquare, has been a work in progress for more than three decades, having its origin in 1976 with a single square roughly sketched with a pencil and about half a centimetre in dimension. In the making of that small sketch I had no immediate impression of it as a herald of things to come, the first of a multitude of squares in varying dimensions. In fact, although tentatively embracing the idea that a step had been taken in a fresh direction I must admit that it is seemed at first a rather naïve pursuit. However as time passed, and with increasing confidence, through a process of building up images in a mosaic-like manner with the square motif, firstly by tens, then hundreds and then by thousands, the series continued to evolve, and through a changing array of tools and materials. Acrylic on wood panel | 168cm x 168cm | Winner of the OPEM 3 (2014) Purchase Prize sponsored by the Helsam Trust. Palmer’s large scale paintings and digital works are created by constantly repeating a single square, and subtly changing its colour. The idea of the square first appeared in his work during a retreat in 1976 and has been a motif in the works ever since. Palmer describes the square as a ‘gift’ for his artistic expression. Palmer has CVD (colour deficiency) and thus can’t differentiate certain hues of colour, making his use of colour remarkable. The works are inspired by landscape, sunsets and the relationships between family and friends. The harmonious gently shifting colours taken from the nature encourage us to appreciate the beauty around us. 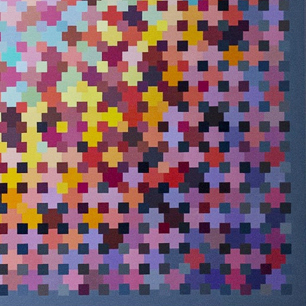 Palmer’s background in music leads him to visualize the square as a single note and take it as a starting point to create symphonies of colour and pattern. The connection with music and the mathematical basis of composing links well with his adoption of the pixel in 2008. The link between the square and the pixel, and for that matter the atom, as a building block led to his use of Photoshop, which has allowed Palmer to explore new avenues and work of greater intricacy.